Blending luxurious comfort with superior audio clarity and sleek, polished looks, Plantronics EncorePro headset delivers unprecedented style and performance to contact center professionals. 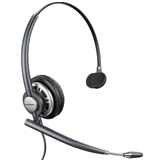 The perfect headset for contact center professionals! Monaural wearing style — can be worn on either ear, letting you hear the conversation and what's going on around you. Extendable low-sitting boom — ensures precise positioning so customers hear every word. High-frequency wideband audio — for crystal-clear customer conversations, so you'll hear and convey every nuance. AudioIQ® and Clearline™ — audio technologies ensure precise listening level, sophisticated hearing protection and superior audio performance. Quick Disconnect™ feature — provides compatibility with all Plantronics audio processors and USB-to-headset adapters.